More cost effective with faster turn around time compared to expensive tear outs. No special formwork needed for horizontal or vertical repairs. Achieves strength of fully cured concrete in one hour. Nu-Stair™ achieves a hard initial set of 2,000 psi in just one hour…providing a fast, permanent solution to the problem of broken or worn stair treads and landings. Stands up to outdoor temperature flucuations--will not crack. Nu-Stair's™ powerful bonding agent gives repairs protection against impact, abrasion and freeze/thaw cycles. 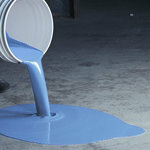 Bonding compound is part of formulation for repairs that last. 20 - 25 SF at 1/4" per unit. Nu-Stair™ is approved for shipping to all 50 states by ground or air.